THE SPOTTED HARE: Stitching is better with friends . . .
Stitching is better with friends . . .
Rebekah and I host the From Our Hands ~ Creative. 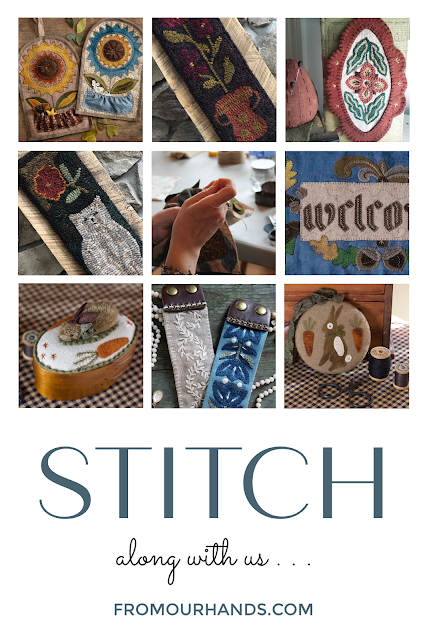 A stitching retreat held in Ohio each spring. I so enjoy this unique and creative experience. Stitching and laughing with friends truly does feed the soul. I could not express any better than they, what the event is all about. So read and enjoy . . .
Maybe you'd like to join us. 1 day registration beginning on Monday, February 11th. May all your stitches be happy ones!